Who doesn't love a good looking piano? 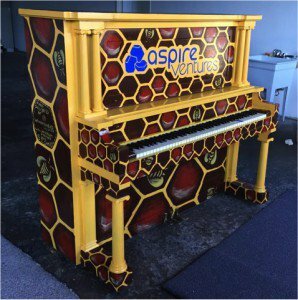 Today, we were thrilled to see the Aspire Ventures logoed piano wheeled just outside of our building on North Queen Street in Lancaster. This will be one of more than a dozen decorated pianos placed around the city all summer long as part of the Keys for the City Program put on by Music for Everyone. MedStatix's own Scott Haiges sits on the Board of this wonderful organization. If you're making your way downtown, be sure to take a moment to tickle the ivories!